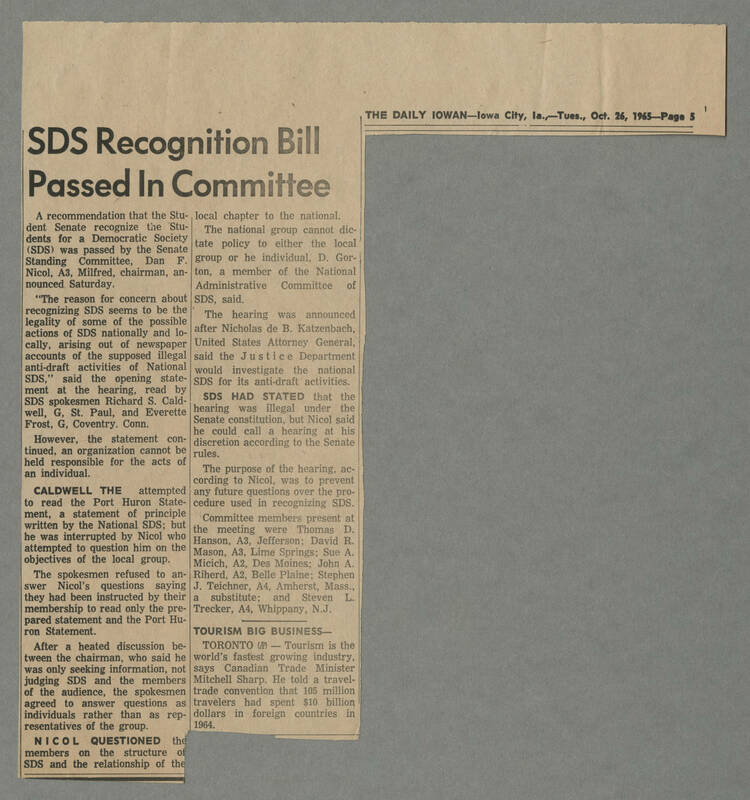 THE DAILY IOWAN - Iowa City, Ia., - Tues., Oct. 26 1965 - Page 5 SDS Recognition Bill Passed In Committee A recommendation that the Student Senate recognize the Students for a Democratic Society (SDS) was passed by the Senate Standing Committee, Dan F. Nicol, A3, Milfred, chairman, announced Saturday. "The reason for concern about recognizing SDS seems to be the legality of some of the possible actions of SDS nationally and locally, arising out of newspaper accounts of the supposed illegal anti-draft activities of National SDS." said the opening statement at the hearing, read by SDS spokesmen Richard S. Caldwell, G. St Paul, and Everette Frost, G. Coventry. Conn. However, the statement continued an organization cannot be held responsible for the acts of an individual. CALDWELL THE attempted to read the Port Huron Statement, a statement of principle written by the National SDS; but he was interrupted by Nicol who attempted to question him on the objectives of the local group. The spokesmen refused to answer Nicol's questions saying they had been instructed by their membership to read only the prepared statement and the Port Huran Statement. After a heated discussion between the chairman, who said he was only seeking information, not judging SDS and the members of the audience, the spokesmen agreed to answer questions as individuals rather than as representatives of the group. NICOL QUESTIONED the members on the structure of SDS and the relationship of the local chapter to the national. The national group cannot dictate policy to either the local group or he individual. D. Gorton, a member of the National Administrative Committee of SDS said. The hearing was announced after Nicholas de B Katzenbach, United States Attorney General, said the Justice Department would investigate the national SDS for its anti-draft activities. SDS HAD STATED that the hearing was illegal under the Senate constitution but Nicol said he could call a hearing at his discretion according to the Senate rules. The purpose of the hearing, according to Nicol, was to prevent any future questions over the procedure used in recognizing SDS. Committee members present at the meeting were Thomas D. Hanson, A3, Jefferson; David R. Mason, A3, Lime Springs; Sue A. Mielch, A2, Des Moines; John A. Riherd, A2, Belle Plaine; Stephen J. Teichner, A4, Amherst, Mass. a substitute; and Steven L. Trecker, A4, Whippany, N.J. TOURISM BIG BUSINESS TORONTO - Tourism in the world's fastest growing industry says Canadian Trade Minister Mitchell Sharp. He told a travel trade convention that 105 million travelers had spent $10 billion dollars in foreign countries in 1964.